The best way to photograph the Denali National Park is to spend enough time there and immerse yourself in the environment. In this post, I will share with you our photography highlights in the Denali National Park during our Alaska road trip, including photos of wildlife, mountain landscape, milky way, Aurora and more. The biggest obstacle between you and a perfect picture in Denali is the weather. No matter what time of the year you come into the park, it is no surprise that Mount. Denali ( McKinley) sits behind thick clouds. From various sources, we learned that the chance of having a completely clear sky above Mount. Denali lies somewhere around 10%. And the weather is very unpredictable – sunny sky in the last minute could turn into heavy snowfall in the blink of an eye. Since we were traveling without too much time constraint, we decided to spend 5 days in the park with 4 nights spent in the Wonder Lake Campground deep in the park. If Wonder Lake sounds unfamiliar to you, it is, in my opinion, the best place to spend a couple of days in the Denali National Park if you want to get a flavor of wilderness and remoteness while not in complete isolation. Most travelers get into the Denali National Park through the Park Rd. which is an unpaved, 92-mile road from the park entrance to Kantishna. The Wonder Lake Campground sits at Mile 85 on the Park Road. Since private vehicles are prohibited beyond Mile 15, taking the camper bus is mandatory. Our photography journey starts right from the camper bus. According to the Denali National Park website, “this park is home to 39 species of mammals, 169 species of birds, and 1 lonely species of amphibian.” And the best place for wildlife viewing is on the bus – you scan through thousands of acres of land without moving your legs nor worrying about the danger of sudden bear encounter. In fact, that was the only time we wished for bear sighting, the more, the closer, the better. On our camper bus trip from the park entrance to the Wonder Lake, we caught sight of 11 bears! In some cases, the bears are fairly close so I was able to capture the moments with a 50mm ~ 200mm kit lens. The fall season brings out the colorful environment, a nice decoration in a wildlife photo. As the camper bus followed the meandering road through mountain ranges, I was wondering how cool the scene would look like if I could use a drone ( and of course this was a daydream since drones are banned in National Parks). However, there were occasional opportunities for capturing such a scene, when there was another camper bus driving in front of us. I was glad that I caught one of these fleeting moments. Once in a while, the camper bus stops for some refreshing air which is usually an excellent chance to take a couple of snapshots of the park. As you can see from the previous photo, the weather was not so encouraging. But for a meaningful photo, it doesn’t have to be that pretty. I was perfectly fine taking photos with a gloomy sky as they illustrated the vastness, remoteness of the park. Bus driving into the Denali National Park through the Park Road. Following the same idea, I took another photo showing the camper bus driving to the Wonder Lake Campground – with some effort – since the shooting location was about a mile away from the campground and we had to walk there and wait for a perfect timing. There are actually more photo opportunities along the park road than you might think, especially when you are camping in the park for several days. We stayed in the Wonder Lake Campground for 4 days. In some days when we needed to recharge our batteries or use the laptop to backup photos, we took the camper bus back to the Eielson Visitor Center at Mile 66. On Sep. 11th, when we arrived at the Eielson Visitor Center, it was snowing so badly that I could see nothing outside. So we decided to process some photos and wait for the last camper bus to take us back to the campground. While I was working hard with photos, I suddenly sensed a strong beam of light coming in from the door. Outside there was the sun piercing through thick clouds, lighting up patches of land. I grabbed my camera and captured that brave hiker embracing the sunlight. A panoramic photo seemed mandatory at such point. This is where your Denali photography dream comes true. When the sky is clear, you can have a direct view of Mount. Denali right at your tent, with the foreground being the vast vibrant tundra – if you happen to be in the right tent sites. I will have a separate post talking about the detailed comparison of each of the tent sites in the Wonder Lake Campground. Located about 27 miles north of Mount. Denali, there is an altitude difference of ~18,000 ft. between the Wonder Lake campground and the peak of Denali. This dramatic altitude difference packed into the small distance makes the wonder. However, when I used a wide angle lens to capture the scene as above, the scale of the mountains was easily obscured by the perspective distortion. Thus using a mid-range focal length or preferably a telephoto lens is my recommendation. Of course, you need to find a further-away shooting spot to accommodate the subjects in the shot. One of the big reasons for people to visit Alaska is the Aurora. Although the solar activity which determines the strength of the Aurora reduced quite a bit in the year of 2017, it is still possible to have splendid Aurora over your head at the Wonder Lake campground. Just around the campsite, there are several other excellent photography locations. 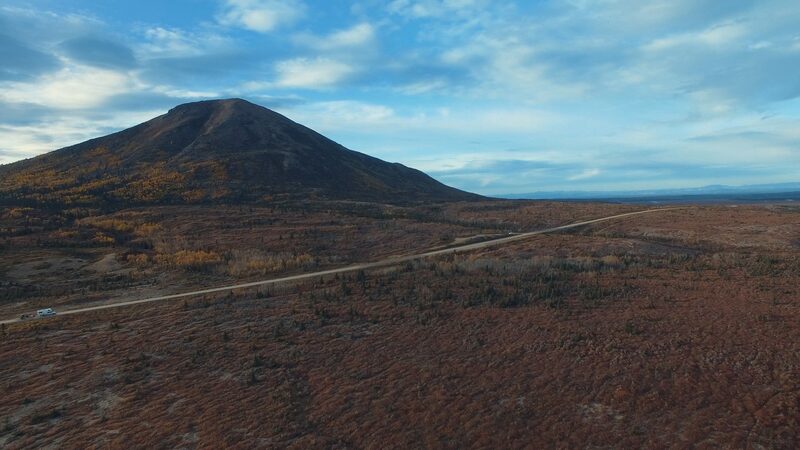 Simply follow the uphill road at the campground and within 5-minute walking distance, you will reach the hilltop with an unobstructed view of the tundra and the mountain ranges. On the first clear morning during our camping in the Wonder Lake, I arrived there before sunrise. There was nobody else but me enjoying this moment of solitude. I set up my camera for a sunrise time lapse video, and stayed there quietly, taking in the view and digest it slowly. After I finished the time lapse shot, the colorful tundra and the majestic Mount Denali lured me into the backcountry trail. I set my camera to interval shooting and let it fire by itself. And luckily, I was in the right spot in several photos. Another great location near Wonder Lake is the McKinley Bar trail where you also have great views of distant mountains. Moreover, the trail serves a leading line for your composition. And surely we love to make some fun photos. This is the gem of the Denali National Park. I am so glad that we decided to walk there during a cold night wishing to see the Aurora above Mount. Denali. We didn’t see the explosive Aurora as we wished for – it hovered above the horizon but never came up in the sky. However, we were lucky enough to have a clear night with no moonlight, which was perfect for capturing the milky way. The pond was calm and pure, a perfect illustration of its name. As the sky darkened, we started to see the milky way by our naked eyes. I set up my NX500 with the Samyang 12mm F2 lens for the time lapse shot, and use my main camera Pentax K1 and DFA 15-30mm F2.8 for the milky way shot. Because of the rotation of the earth, super long exposure of the sky results in star trails instead of sharp stars in a milky way shot. A general rule for photographing the milky way without producing star trails is to limit your exposure time (in seconds) below 500/focal length (mm). For example, when using a 20mm lens ( full frame equivalent), the max exposure time is 500/20 s = 25s. To be safe, I usually use a little bit less exposure time. However, if you have the latest cameras from Pentax, you can take advantage of their Astro-tracer function, which uses your GPS location to calculate the earth’s rotation, and then rotate the image sensor during long exposure accordingly to allow longer exposure time without producing star trails. I will elaborate on the execution and post-processing of milky way shots using this function in a future post. Anyway, I was able to capture the milky rising above Mount. Denali in a very clean image. When I came back and looked at my time lapse video from the other camera, I was surprised to find the glowing green color on the mountain which was barely noticeable by naked eyes then! When I look back our photography experience in the Denali National Park, I still feel the heartbeat as I first saw the inspiring sceneries. I know I will have to come back! I hope you find this post useful or entertaining. If you have any questions or anything to say, feel free to leave a comment. All the photos are just mind-blowing. Thanks for sharing such a wonderful blog post.